When I asked Metabo for this saw to test I must admit I wasn't expecting too much as it looks similar to many other lightweight saw tables that may have enough power to cut, but lack the necessary quality or design thoroughness we should expect when we spend our hard earned money! 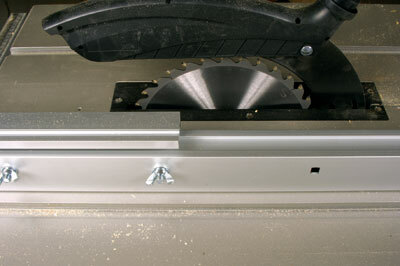 I always hanker after a lightweight table saw as I, like many readers, have a garage workshop and a big heavy cast machine just isn't an option. The reality of setting up and using this machine was quite different. As should be expected from an all-German brand it had a quality about it straight from the box. The separate stand requires care to assemble correctly but it is extremely rigid, square-coated, tubular steel and can be folded up when out of use. 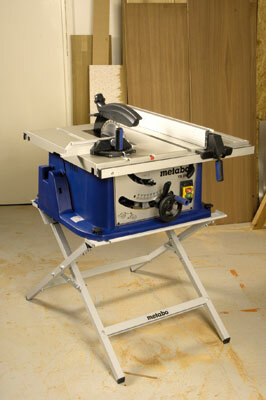 It seems low until the saw is mounted (it only fits one way round), then the saw table comes up to conventional working height. Care is required sitting the saw on the base, help is advisable. 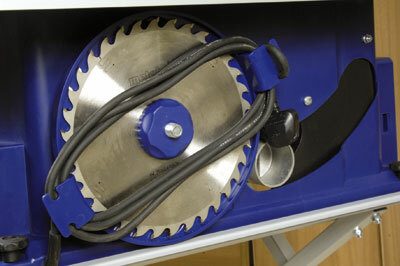 Once in place the captive base nuts align quite easily with the threaded knobs that hold the saw on to it. 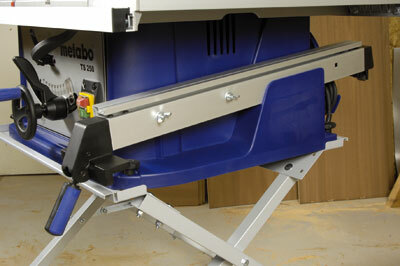 There are various bits to be assembled on the saw but nothing too challenging as long as you follow the manual. There are some nice design touches, the moulded plastic casing seems potentially vulnerable but seems to work ok. Because it is plastic, various moulded shapes allow stowage for the rip fence and a there is a place at the back for service tools hidden behind the spare rip blade. The table top is a textured but agreeably flat, thin aluminium casting. 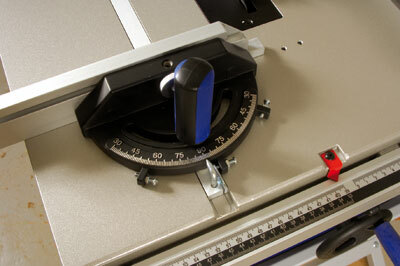 It has two mitre protractor slots and the rip fence clamps on to extrusions fitted back and front. The blade guard is nice and rigid with a hose outlet on top, and there is a 65mm o/d dust outlet at the lower rear of the blade housing. Returning to the front there is a large handwheel for raising and lowering the blade, this is remarkably easy to adjust. The lock lever around it undoes the blade tilt, again a very easy slide action and easy to lock. 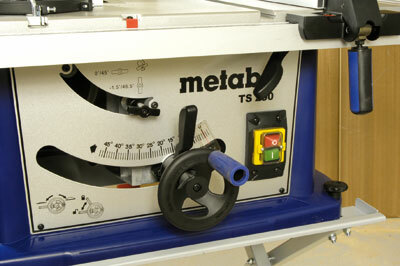 A small lever lock above, when turned through 90 degrees allows tilt past 45 degree to 46.5. 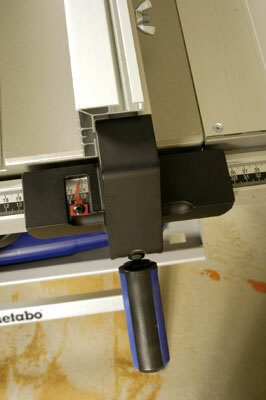 At the ends of the tilt slot are two plastic eccentric cams that allow adjustments at each end of the tilt range. This typifies the care in the design - adjustments are available on all the settings. Another lever underneath undoes the table extension; I found I could cut a 670mm wide panel easily as a result. Lastly, the on/off switches are the standard pattern for a machine like this and operate a direct drive brush motor. Not much to set up, any zero adjustments were a minor matter to sort out; the fence is commendably easy to move and set. On start up the motor sounds slightly 'ragged' but settles quickly to a smooth if rather 'bright' note typical of a brush motor, acceptable but does requires ear defence for prolonged use. The adjustable sub-fence cannot be pulled far enough forward for rip cutting solids but still extends too far towards the operator. The motor does slow a little with deep rip cuts but copes well and the rip blade gives almost a planer finish. The top side of a cut on veneered board is very neat with some fine breakout underneath. There is remarkably little to criticise about this machine. The fence is the odd one, not being ideally configured for solid wood if it misbehaves while cutting. 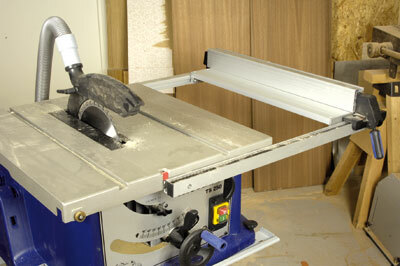 It seems to me to be almost the ideal answer to the basic requirement for a home workshop set-up where space is limited and is also very good on site too. I think it is worth the initial outlay and should give years of reliable service. "I think it is worth the initial outlay and should give years of reliable service"